This entry was posted in Guru, ISKCON, My spiritual Journey, Srila Prabhupada and tagged acharya, Guru, Guru tattava, HH Gunagrahi Maharaj, HH Mukunda Gosvami, instructions from guru, Miracle on Second avenue book, Nitya sidha, position of acharya, Prabhupada and his spiritual master, read Srila Prabhupada books, Rukmini Krishna Prabhuji, Srila Bhaktisiddhanta Sarasvati Thakur, Srila Prabhupada, touching the heart. Bookmark the permalink. the incident mentioned is very touching and equally inspiring to know more and more about our most beloved guru HDG Srila Prabhupada. His mercy on us is limitless. This i say because i am very fallen and commit lots and lots mistakes knowingly or unknowingly but he still keeps on giving and accepting service through any means. 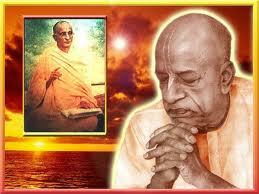 i have no words to thank Srila Prabhupada for establishing all this. This is a revolution in real terms. i also want to express my gratitude towards you for writing this gem of work so that we fallen ones can be benefited.